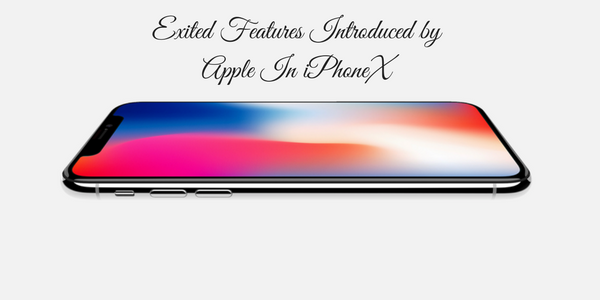 Apple’s new iPhoneX is full of exciting features to amaze iPhone lovers. Its edge-to-edge OLED multi-touch display amaze the consumers. Undoubtedly iPhone previously introduced were water & dust resistant but now Apple’s new invention has a 15cm display that is called its Super Retina Display. Some of the features include facial recognition, wireless charging OLED multi-touch display and much more is available in iPhoneX. Apple has successfully introduced a new era of its devices on its 10th anniversary that boost consumer’s confidence, loyalty, and expectations. Some of the exciting features introduced by Apple in iPhoneX are enlisted below for a brief description. These are few features available in iPhoneX camera. Oh! Where is the home button in iPhoneX? There is no home button available in it because Apple has intelligently replaced it with different functionalities and gestures to make it more user-friendly. Its strong sensors deduct and response to consumer voice, facial recognition and even with a glance. You can simply touch your screen to activate your account. Apple has enhanced facial recognition with its brilliant new depth camera system. Face ID is used to unlock Apple Pay feature and variety of third-party applications including touch ID. It is a revolution in your phone security because your face is now a password on the phone. A11 Bionic is a smart & powerful chip introduced by Apple’s new smartphone. It enables to perform up to 600 billion tasks per second. Its faster central processing unit has improved the speed more than earlier. Powerful & wireless charging feature is introduced by Apple in iPhoneX. It has started to make the dream of wireless future come true. Its devices support Qi wireless charging with AirPower. This AirPower will not only support in charging an iPhone but also Apple watches and AirPods. Apple has enhanced its battery life compared to others. An innovative feature introduced by Apple in iPhoneX is Apple Pay. This feature is just above beyond consumer expectations. Apple Pay could be easily used for retail shops including coffee shops, pharmacies etc. this process could be used by the following approach. This is a simple procedure to use Apple Pay. If Face ID didn’t recognize you, simply tap to “pay with password”. Enter your password and tap to pay terminal. Apple has introduced IOS 11 with brilliant features and capabilities. It’s speed let the user complete their tasks in an organized and speedy way. It sets new standards for an advanced OS that make it more capable. iOS 11 is going to introduce the most powerful, personal & intelligent devices. Apple introduced innovated features in iPhoneX from scratch to end mean from IOS to display. It amazes the audience and exceeds their excitement level.